Artist and Empire at Tate Britain is a survey show of art related to the British Empire, sourced solely from British collections. But if the title, theme and tagline: ‘Facing Britain’s Imperial Past’ suggests something quite totalising, even self-aggrandising, then the subtle, complex, and sometimes ambiguous tone that pervades the rooms of the show seem to quietly undercut its grand aims. If in its most clichéd sense, the idea of facing the colonial past is supposed to imply something difficult, Artist and Empire, creates only moderate and occasional discomfiture. The difficulty of grappling with unwieldy, complicated and traumatic histories spanning continents and centuries is minimised in what is ultimately a restrained and fairly traditional display of static objects; a safe and tasteful space from which to survey the complexity of Empire, never overly didactic, affective or confronting. This may be, at least partly, a deliberate strategy, to bypass a broad cultural reluctance to facing Britain’s colonial history, which as Elizabeth Edwards and Matt Mead describe it, is ‘felt as difficult, shameful and perhaps even unspeakable’.1 Paul Gilroy, in his foreword to the exhibition catalogue, praises the show’s capacity to ‘contribute a liberating alternative to the nostalgia and melancholia that have often made it difficult to grasp what Empire should mean for British people today’.2 This liberating alternative is at times, an ability to freely trace and interpret the connections and parallels between a vast range of artworks, across and through the exhibitions themed rooms, with minimal curatorial interference. On another level, the exhibition feels infused with a kind of elegant critical aesthetic; one that suggests complexity without creating the kinds of ruptures, discontinuities and frustrations with the content that complexity should entail, historical threads are there for us to pick up at leisure rather than to untangle. On the one hand, this exhibition invites us to face a colonial past through art, in representational content that speaks to various operations of Empire, from navigation and surveying in the many maps on display, to cultural exchange, assimilation and appropriation, seen in the hybrid styles used in various artworks, or in the adoption of local dress by colonists in grand manner portraiture, through to depictions of historical events, the military conquests and negotiations shown in numerous history paintings. At the same time, the exhibition also points to the colonial and post-colonial histories of art itself – its central role in creating, sustaining and sometimes resisting colonial hierarchies, systems and relations – as propaganda, as items of loot and trade, as scientific knowledge, and as artistic critique. Arts central role in promulgating the ideologies of Empire is most obvious in a room called ‘Imperial Heroics’ predominantly dedicated to British history painting. Some of the most blatantly sensational images on display include four paintings that reference the Indian Rebellion of 1857 (or India’s First War of Independence), which together form an excessively biased account of the conflict – from depicting British victims as ghostly pale women and children in Joseph Noel Paton’s In Memoriam (1858), to heroic British soldiers being seen off and welcomed home by gentle British women in Henry Nelson O’Neil’s Eastward Ho! August (1857), and Home Again (1858), to a sword wielding Mother Britannia (or Justice) about to suppress the rebellion, depicted in the form of a Bengal tiger, in Edward Armitage’s Retribution (1858). Coming at the mid-point of the exhibition, taking centre-stage, such paintings might seem to warrant the exhibitions light critical touch, their role as emotive propaganda is clear. It is primarily in this section that the exhibition can lay claim to revealing art of the past that has itself been subject to a kind of wilful cultural concealment. As the show’s curator, Alison Smith writes; ‘Concerns that the subject should not be endorsed in any way have resulted in objects being kept hidden away in storerooms and basements.’3 Setting a stage for the re-emergence of some of these paintings, the show directly confronts their implications within colonial power, but also shows little reflexivity over whether such images might continue to partially function (in the art museum, within gilded frames) as veneration of heroic figures, events and ultimately of the artists who created them. In other instances, the exhibition reveals how the overtly ideological image might be valued, not only for its ability to speak to its own complicity, but for the presence of traces of histories and perspectives it seems at first glance to exclude. 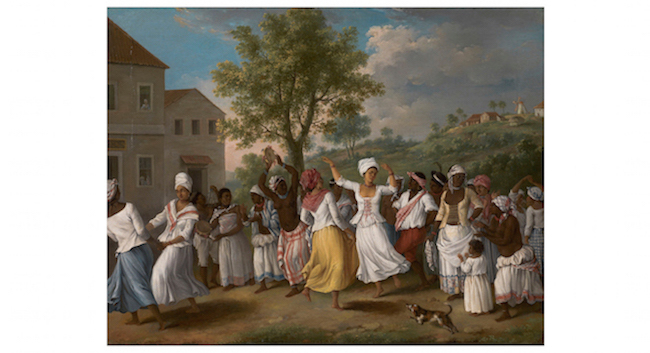 Agostino Brunias’ Dancing Scene in the West Indies (1764–1796), acquired by the Tate in 2013, is a festive image of Caribbean women dancing together, most likely on a slave plantation. It was slightly jarring to encounter this image, which seems to so perniciously glance over the harsh realities of slavery, accompanied by a wall text that might seem apologist in tone: ‘Brunias’s works are now appreciated as insights into 18th-century transatlantic cultures.’4 Scholarship on Brunias, while acknowledging its participation in a broader culture of disavowal of slavery’s brutal conditions, has also managed to find alternative narratives and historically significant information in its pictorial content. Beth Fowkes Tobin, for instance, finds in the depiction of slaves in fine clothing and jewellery, possible narratives of slaves who had managed to accumulate wealth, giving to its subjects, perhaps unintentionally, a form of historical agency.5 But the consolidation of this specialist discourse into a single sentence in the exhibition, instead of signalling complexity in the image, seems only to achieve a neat recuperation of it. Post-colonial scholarship has long found narratives of individual agency within the colonial image, but instead of performing a complex probing into contradictory narratives that might produce greater agency, I sometimes found myself frustrated by a lack of critical contextualisation in the exhibition. Agostino Brunias, Dancing Scene in the West Indies, 1764-96. Oil paint on canvas. 508 x 660 mm. Tate Collection. The need to rely on a complicit and suspect colonial archive is also addressed by some of the contemporary works featured in the ‘Legacies of Empire’ section that closes the show. Brook Andrew has based many works on material related to Australian Indigenous histories found in anthropological collections and archives. On display in the show is The Island I (Red Mound) (2007), one of a series of works that feature images from an album compiled by a Prussian naturalist, William Blandowski, in the late nineteenth century. Blandowski’s album often features photographs of drawings and illustrations, that were in some instances, writes Professor Nicholas Thomas, ‘twice or three times removed from field sketches that were perhaps themselves imaginative, even falsified or fantastic’.6 As though continuing this process of transmutation, Andrew manipulates his source image, an illustration by Charles Sturt of an Aboriginal burial mound and funerary site, enlarging its dimensions and changing its surface to a red reflective foil. Blown up, made red and shiny, imposing and alluring, the archive clamours for our attention – perhaps both to compensate for its past obscurity, and terrible inadequacy as an unreliable trace of lost cultural practices. In contrast to works that use the archive to construct alternative or counter-narratives, Andrew seems to enhance some core potential of the image – pressing it even more towards spectacle, fantasy, strangeness and even absurdity. As Anthony Gardner has written: ‘There is a degree of humour in this process: the caricatures in The Island are so blatantly twisted in appearance, such a telling mix of proto-sci-fi and ‘primitivist’ constructions, that it’s remarkable how any person or culture could possibly believe in their veracity.’7 Andrew, who has been credited as revealing lost or little known images, also seems to parody such processes, at play in this very exhibition, which seek to find productive contemporary uses for the art of Empire. While ultimately optimistic about the possibility that artistic impressions of the past can be used to investigate cultural histories, Andrew equally reminds us that the fantasy of the image continues to be highly functional and seductive. That mining the image is itself an alluring fantasy of redemptive historical recovery. The prevalence of sheer fantasy in the colonial image can be found throughout the exhibition. A prime example is George Stubbs’ painting, Portrait of a Large Dog (Dingo) (1772), which was based upon an oral account of witnessing dingo during the Endeavour voyage, and appears in the painting as a strange hybrid between a dingo and a European fox (though far closer to the latter). This painting, along with Stubbs’ Kongouro, from New Holland (1770), were the first images of Australian fauna to be seen in Britain, and became the subject of much debate in 2013, when the National Gallery of Australia unsuccessfully attempted to acquire them. A prominent advocate of the campaign to ‘Save Our Stubbs’, David Attenborough described them as ‘a very key part in the history of zoological discovery’,8 while the committee reviewing a successful application to delay their export agreed their ‘lack of anatomical accuracy evident did not diminish the paintings’ significance. The fact that Stubbs produced these paintings without having seen them in the flesh was historically significant’.9 Ironically, the competing claims for these paintings as national cultural heritage seem foreshadowed in the image, by how adrift the ‘dingo’ appears, seeming to belong nowhere, stranded in an unidentifiable landscape that blends easily into the clouds, almost as if Stubbs was signalling the imaginative powers of conjuring this creature from mere scraps of information. This is the sheer power of the fantasy of Empire; that it can name without knowing, represent without understanding, and still be celebrated as productive of scientific knowledge. Even the more accurate of the naturalist imagery of Empire perpetuated fantasies of exotic revelation and containment, subjecting all species to the same representational and classificatory regimes, and branding them as new discoveries. As Thomas Richards has argued, the entirety of Britain’s vast colonial archive can be seen as constructive of a kind of fantasy of a total Empire that could be knowable and therefore controllable.10 The dingo may have broken free from association with Stubbs’ early attempt to reproduce it for British eyes, but since colonisation has been subject to a similar bifurcation of its identity, caught between binaries such as native or introduced, wild or domesticated, safe or dangerous, pest or ecologically important, evading easy reconcilement within Western classifications. It is welcome to see Stubbs’ painting in a context that designates it with the possessive quality of a trophy, rather than only celebrate it as an act of ingenuity, but I worried (as with many images of the show) if it still retained the potential to seem closer to reality than fantasy, to appear as eminently natural. George Stubbs, Portrait of a Large Dog (Dingo), 1772. Oil paint on canvas. 610 x 710 mm. National Maritime Museum, London. The ‘Trophies of Empire’ section shows the breadth of different fields of knowledge within which the art of Empire was and is imbedded: science, natural history, anthropology and cultural history. Held in collections related to these fields, such objects have not for the most part, as with some of the history paintings, had a cessation in their status as valuable pieces of cultural heritage, but have also rarely been seen as objects of high art. Ironically, the reverse has been true for some of the history paintings, which Alison Smith writes were, post-WWII, often loaned to regimental museums and took on ‘an ethnographic role’.11 Ian Maclean has questioned what it would mean to exchange objects from the art museum with those in the anthropological one, asking: ‘Which art – the European or the Indigenous – would be modern, and which savage?’12 In Artist and Empire objects from The British Museum, The Natural History Museum, The Museum of Art and Anthropology Cambridge (to name a few), are brought together within the art museum, to exchange values and meanings within the thematic frame of colonial object collecting and knowledge production. But rather than radical recontextualisation, something of their former museum contexts seems to have been retained. On one wall, three objects are mounted in display cases, each figurative sculptures rendered in dark coloured materials; a bronze head from Benin City, Nigeria, by an Edo artist, a carved wooden male figure by a Maori artist, and a wooden female figure from Sierre Leone, by a Sherbro Mende artist – a grouping which seems to evoke ethnographic modes of classification and display. But if this was a deliberate critical strategy, it is one too subtle to be clear. A more cogent critique of display and viewing practices comes later in the exhibition, in two etching by Tony Phillips from the series ‘History of the Benin Bronzes’ which reference these objects original acquisition, stolen during a British punitive raid of Benin City in 1867. These looted objects, since dispersed amongst museums in Europe and the USA, have been at the centre of numerous debates and campaigns over reparation and repatriation. In Phillips work Face to Face (1984), a detailed depiction of a Benin Odudua helmet mask appears behind glass, gazed upon by a (presumably) Western woman.13 The image, which appears in the final room of the exhibition, effectively implicates the viewer’s own visual consumption of a Benin sculpture, three rooms earlier; a spatial and temporal separation that means the critique cannot serve as immediately redemptive. But I also wonder whether this sets up a kind of critical sleuthing that ultimately feels rewarding rather than disruptive. This is part of a broader strategy in the exhibition, where each of the works in the ‘Legacies of Empire’ section refers to a theme or type of art presented shown in previous sections, and which might open themselves up for greater critical reflection to the diligent viewer who has been paying close attention. Such a technique might function well for forming a few connections, but also seems to invite a kind of opt-in critique that might be had, if feeling up to it, after five other rooms replete with objects. While the exhibition explores the vast mobility of objects and artworks during the time of Empire (especially in regard to its ‘trophies’), it only minimally addresses their current immobility – stuck behind glass in collections far-flung from their original contexts. The exhibition offers up a kind of compensatory discursive mobility, suggesting the potential for on-going productive recontextualisation of such objects within museum contexts, through temporary shifts from the ethnographic museum to the art museum, or understood anew by mobile bodies invited to think back as they move through the exhibition. It will also be interesting to see how the show’s theme will be re-imagined at the National Gallery of Singapore in October, where some of the works are travelling for a co-curated exhibition that will focus more on a South East Asian context. But while these actions are nothing close to a radical redress for these objects’ relatively static lives, it does serve to make boundaries temporarily more porous and to suggest complex relationships between objects usually relegated to more disciplined confines. For Gilroy, democratic potential lies in the art of the colonised, long relegated to the margins, racialised in the ethnographic museum, being lifted into the same frame as the art traditionally used to celebrate and support Empire. But I wondered almost at the reverse effect, whether the art by the coloniser, which is worthy at times of censure, shame, even disgust, is somewhat neutralised by this arrangement, which can at times dissolve into optimism over transcultural exchange. Although the asymmetrical power relations of colonial relationships are acknowledged, and the exhibition does well to avoid the reductive tendency of casting all art depicting colonised subjects as being under a generic ‘colonial gaze’, at other points there feels to be an uncritical equivalency between the artworks on display – do the sexualised, eroticised portraits of subaltern women warrant existence in the same plane as carved figures depicting Europeans and made for trade? Yet the display of such a range of images make it difficult to categorise them along tired binaries, even, at some points, to know before reading the labels, which side of the colonial ‘face to face’ an artwork may come from. As with any subject plotted out onto a spectrum of positions, it gains nuance, but risks having its extremes lose their severity, for them to disappear amidst relativity. One of the images I felt most unease about was the promotional image for the show – one that can be understood as complex and disruptive of familiar colonial narratives – but which, in its use and framing in the exhibition, also seemed to reproduce that old colonial gaze. Rudolf Swoboda, Bakshiram, 1886. Oil paint on panel. 260 x 159 mm. Royal Collection Trust/ © Her Majesty Queen Elizabeth ll 2015. 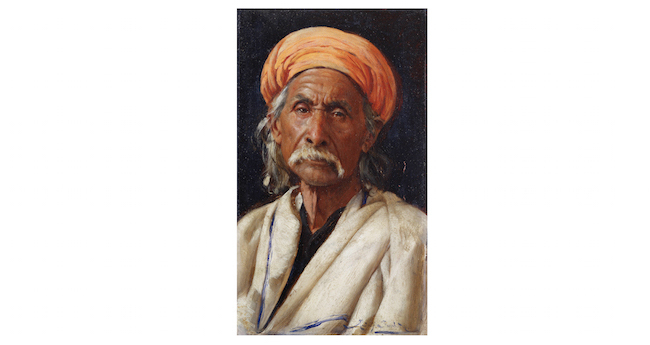 Featured on a large banner as you enter the Tate Britain is a portrait by Rudolf Swoboda, Bakshiram, of a man who had been brought to London as part of a group of artisans from Agra (taken from Agra Central Jail) to demonstrate traditional crafts at the Colonial and Indian Exhibition of 1886.15 It is not difficult to see why such an image was used for promotional purposes – beautiful, and full of pathos for its subject, yet clearly Orientalist, and a product of colonial relations, it seems to occupy the kind of ethically ambiguous middle ground where the exhibition often rests. Part of a series of portraits commissioned by Queen Victoria, the wall text finishes with a sentence that both critiques and redeems the context of their creation: ‘While ostensibly serving as ethnographic studies the portraits are also indicative of Victoria’s interest in her Indian subjects as individuals.’16 In Smith’s descriptions of the portraits for the catalogue, she finds admirable qualities in the artist’s spontaneous style, his ‘quick, deft strokes of the brush’; as well as in the mode of their display in the Indo-Saracenic styled durbar hall at Osborne House (a royal residence), where they ‘could be appreciated as highly subtle representations of named individuals, who maintain their integrity and dignity’.17 But the terms on which this image are so positively positioned, speaks to some of the most duplicitous operations of colonial power structures; that empathy, humanism and appreciation for some cultural traditions, also reinforced the colonist’s claims to being enlightened, civilised, culturally and morally superior – something perfectly illustrated in another painting in the ‘Imperial Heroics’ room by Thomas Jones Barker’s, The Secret of England’s Greatness (Queen Victoria Presenting a Bible in the Audience Chamber at Windsor) (1863), where a kneeling African prince reaches to receive the gift of a Bible, handed down by Queen Victoria. The politics at play in this image, are not so different from that of Swoboda’s, where the colonised subject is gifted the artists sympathetic rendering – to be gazed at as an individual by the Queen herself, and now by streams of visitors to Artist and Empire, there to face a past he represents. Undoubtedly it is the gaze of the subject in the portrait that led to its singling out. As Smith describes it, he ‘looks directly at the spectator with a piercing yet inscrutable expression’.18 As the face of Artist and Empire, this melancholic yet dignified expression reads as an indictment against Empire even against the subject’s own subjugation. I wonder though, whether this image is not also used in a broadly similar fashion to the time when it was painted – to incite empathy and an overtly personalised reflection of distant places, people and histories. This is the politeness with which Artist and Empire treats its own subject matter, a desire to give agency but without a willingness to perhaps give up on some of its own dignity. Jessyca Hutchens is a doctoral student at the Ruskin School of Art at the University of Oxford, working on a thesis on contemporary artist-in-residency programs. She is a Charlie Perkins scholar and originates from Western Australia.